Sarah’s Angel and Life’s Blessings! I need to go campin’–seriously! This is my favorite season in the mountains around Tucson and this little picture by the wonderful artist Violette captures my feelings exactly! I want to wander–I want to GO!–I want to be lost in the immense pleasure of sloth and campfires and reading books under an ancient old sycamore with leaves tinged with gold, and maybe even splashing in a little crick! I’ve been beeeeeezy–too beeeeezy–waaaaay too beeeezy for good mental health and the life of peace and joy I crave. Soooo, I’m off for a few days of camping in early October!!! Meanwhile, I am counting my many, many blessings. In a recent cool class at the Cottage, Sarah created this awesome angel that reminds me of the VITAL things in life. Hope. Dance. Be Happy! Yesterday is gone, Tomorrow has not come. We have only today. Let us begin. G0 check out my new slate of October classes by clicking the Kaitlin’s Creative Cottage Classes tab above…we’re doing a really fun papier mache mask class, Teresa is sharing a fabulous technique for copying your art onto a variety of cool papers and tapes, the book class will teach you lots of cool techniques for adding fun elements to your work (pop-ups! ), I’ll teach you how to make beautiful marbleized papers, and a trillion ways to use tissue paper to make amazing textures! We’ll have a great month of massive fun, shared giggles, and oodles of new creative adventures! Sign up quick–classes are selling out fast! And don’t forget, life is full of blessings–go out and get yourself some! I am! © Copyright, Kaitlin Meadows,2014. All Rights Reserved. I’ve had the most amazing life! I was blessed to come of age, graduate from college, and leap headlong into the magical energy and creativity of the California Bay Area culture of Peace and Love in the late 60’s. I lived on a commune, cultivated acres of organic vegetables, made costumes & festival clothing for Renaissance Fairs, made music & love & babies & joy in an incredibly nourishing environment with people who cared passionately about the planet, peace, and each other. I was saturated in an atmosphere of constant creation! Those years shaped who I am and what I stand for. Last week I turned 68 and I feel I am on the cusp of another huge growth spurt in my life…Life continues to delight, absorb, and enchant me! There were 400.000 participants! And we were there in spirit! The Girlz have each pledged to do their part to protect and preserve the planet. They are the ones who will be inheriting the world we have made for them–please join me in helping to make it a more beautiful and sustainable place! When I was done they had tears in their eyes, “I love that someone cares about all those who have been hurt by hatred and violence enough to write stories that might change people’s hearts!” said eight-year-old Katta from Nigeria. And I have such a beautiful circle of wimmin who call my Creative Cottage their second home–making art and taking wing, creating and evolving, and sharing their deep stories and open hearts with each other! I am blessed beyond measure…I am renewed and enlarged and excited about life! I am a happy old hippie–still working for peace and social justice, still growing organic vegetables and making compost, still making music and dance and love and laughter the center of my life! Thank you for being a part of my life and The Creative Cottage! Happy Autumn! Love and Joy to You! Had a beautiful time! LOVE Ocean Beach–the perfect blend of old hippie charm, funky beach town, and fantastic ocean fun! It’s amazing what just getting away for a day or two can do for your spirits! As some of you know, I was kinda “runnin’ on empty” before I left. It’s been an extraordinarily busy time with the Girlz With HeART Project getting all the young ladies safely back in school and The Creative Cottage has been rockin’ with classes (I promise pictures and news in the next blog post! )–and I’ve been trying to cram the usual ten tons of fun into my five pound bag! Marnie and I shopped and talked, walked and talked, sat by the beach and talked, sat in the courtyard and talked, and generally had a blast (talking all the time)! It was awesome…we hated to leave…but we’ll be back next year for another girlz road trip! Thanks for hangin’ in there with me…thanks for coming to The Cottage for fun classes, and thanks for being my friend! P.S. Please check out my work at the Raices Gallery through October 11th. © Copyright, Kaitlin Meadows. 2014. All Rights Reserved. As many of you know, I have the coolest sister on the planet!!! she is the hardest working person I know–with the biggest heart and the most amazing spirit! Congratulations Kim (and husband Brother Boy) on all the hard work and dedication it takes to live your dream! You inspire me every day, in a thousand ways, and I love you with all my heart! Clear decision making accompanied by determination and hard work has landed Kim Bethel into a life extraordinarily well suited to her. While in her presence you can observe and viscerally feel the satisfaction and contentedness that emanates from someone living a life rooted in place and grounded in earth-based wisdom. 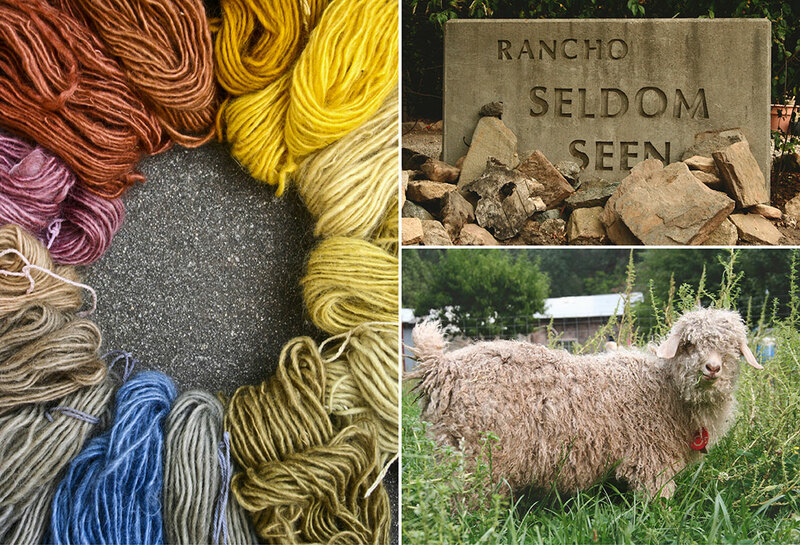 Bethel tends a beautiful purebred herd of angora goats, a prolific food and dye garden, and a fiber mill business—all set on a remote 20-acre land base situated on the edge of the upper San Joaquin River. A little after leaving a remote paved road outside of North Fork, California–we travelled another mile down a rock and oak studded dirt road to find the Bethel’s quiet homestead. “I became more deeply connected to the earth and natural processes at age 14 when my parents took me out of the city and dropped me off at the Finegold Ranch Boarding School… after getting situated there, I realized I’d found heaven.” It was the 1960s when Bethel’s parents decided to send her to Finegold. The school was not your typical boarding school for the time–the school’s founder, Susie Hickman, started the institute as a place where her own long-haired children would have an educational space that wouldn’t condemn them for not conforming to ‘crew cut’ norms of the day. The school was a haven for students looking for an integrated educational experience. In addition to a full suite of academic classes, Bethel was given the freedom to explore and learn wheel thrown pottery, hand-spinning, gardening, caring for goats, and natural dyeing. Kim described the long-term manifestation process she experienced on the way to living the way she does now. “I’d see this ranch from across the little river beach that my children and I used to swim at… and I’d say…one day I’m going to live on land like that.’” Thirty years later, Bethel and her husband Brother now call this land home. It was no small feat that they ended up there—the land had other interested buyers at the time it went on the market, but Bethel made it known to all, including the land-owner at the time, that she was going to take care of it and nurture it like no one else could. Once they were assured ownership and moved in, the state threatened to flood the region for another damn project. 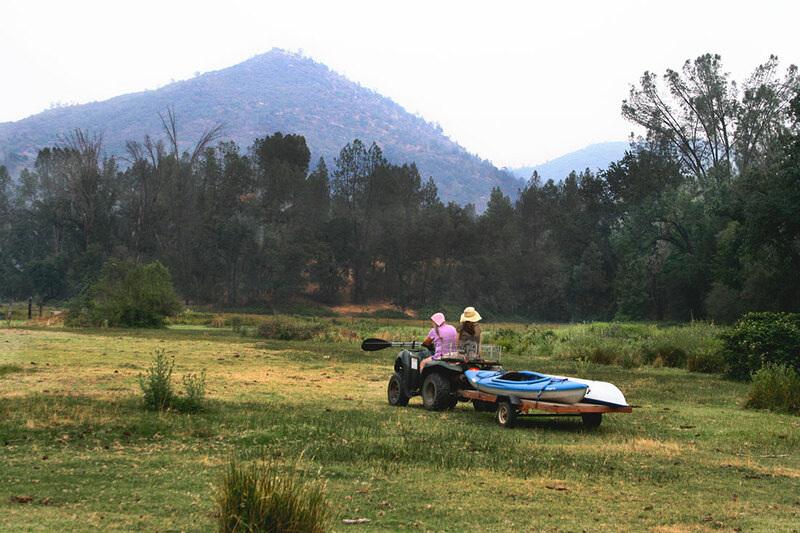 Bethel’s response to the proposed development: “We would just buy a houseboat—we weren’t moving anywhere.” The appropriateness of Kim and Brother being on this ranch is layered. This part of the river was, for thousands of years, Brother’s family’s traditional salmon run gathering and acorn processing spot. From the living room of the ranch house Brother waved his hand in the direction of the water, “In my grandmother’s time the land was dotted with tepees when the salmon where moving upstream.” The people’s acorn grinding rocks remain, now submerged under the river’s dammed waters. The salmon are completely gone. However, the acorn harvest does remain—the evening we arrived we were blessed to share a supper of traditionally processed acorn, ranch-raised and harvested braised rabbit, garden harvested heirloom tomato salad, and lightly herbed homemade goat cheese. Brother is one of thirteen children—and was named for being the first son born after a series of daughters. He is a member of the Mono Tribe and works actively in tribal affairs. The Mono ways are alive in the Bethel home—the food, stories, tools, and knowledge remain as pure expressions of the surrounding ecosystem—mirrors of ‘right relationship’ that seep into your experience while at the ranch…. leaving lasting and significant imprints that illuminate the real possibilities for human interactions to function symbiotically with natural living systems. 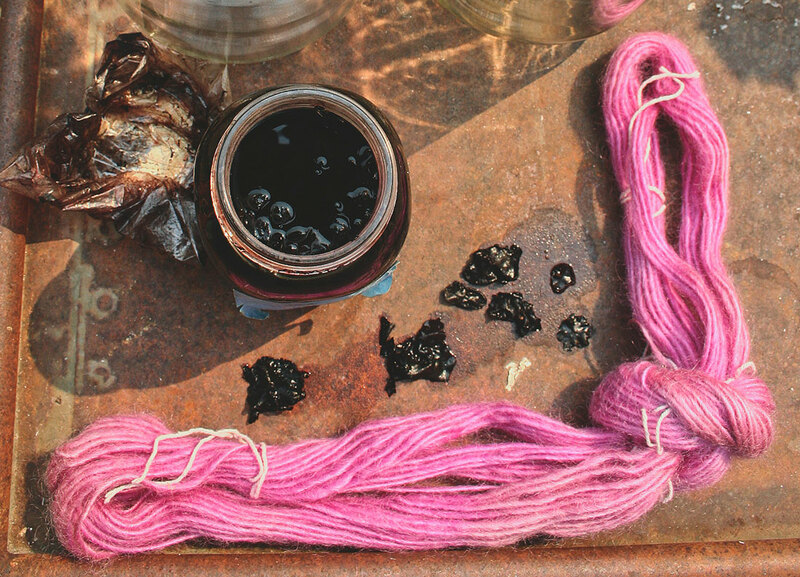 Kim’s work to incorporate fiber and dye into this respectful and responsible land ethic is emphasized by her use of 100% natural dyes grown entirely in her own fertile garden. She raises: black-eyed Susan, two coreopsis varietals, zinnias, dahlias, comfrey, woad, yarrow, hollyhock, tansy, gilardia, goldenrod, yellow cosmos, marigold, mint, chamomile, and purple basil for color. All of her plant dyes are used on angora fiber direct from her own herd. Brother shears the goats twice a year and the fiber is carefully washed in Bethel’s on-site ‘Downhome Fiber Mill,’ that channels all gray water into the garden. The system is heated through solar-thermal—Bethel runs the mill system with an eye for detail and efficiency on every level. “I process all of my herd’s fiber and have a growing number of clients and would like to expand this fiber processing business to more people.” Bethel takes careful documentation of every animal’s fiber weight and keeps records of changes in the fleeces over the years. She keeps each animal’s fiber separate—so you can literally receive processed fiber and remain knowledgeable as to exactly which animal it came from. 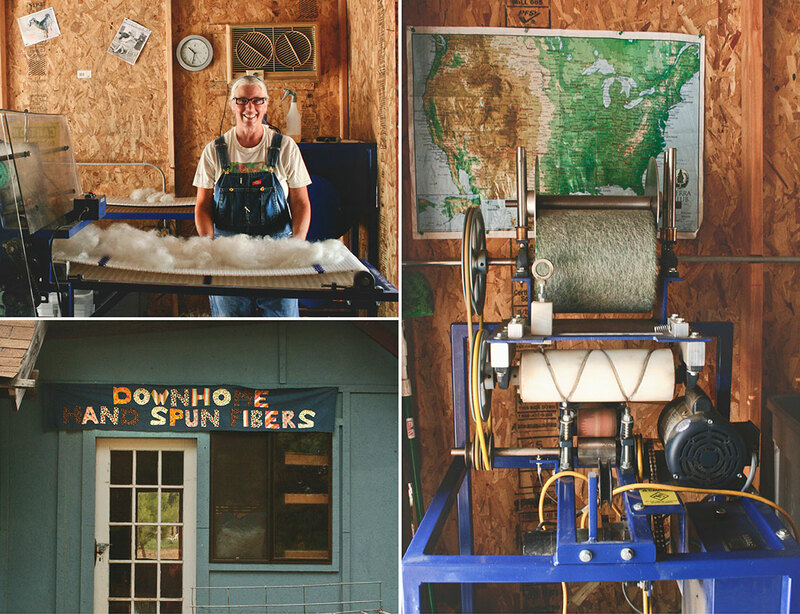 If you have mohair, alpaca, or fine sheep’s wool we highly recommend the Downhome Fiber Mill for your processing needs—the quality of her roving is unparalleled. From the point of milling her roving—Bethel then hand-spins all of her fiber into soft and sheen rich yarns (a total treasure if you are a knitter, weaver, or even jewelry maker). Her yarns, roving, and other goods can be found in her online store. 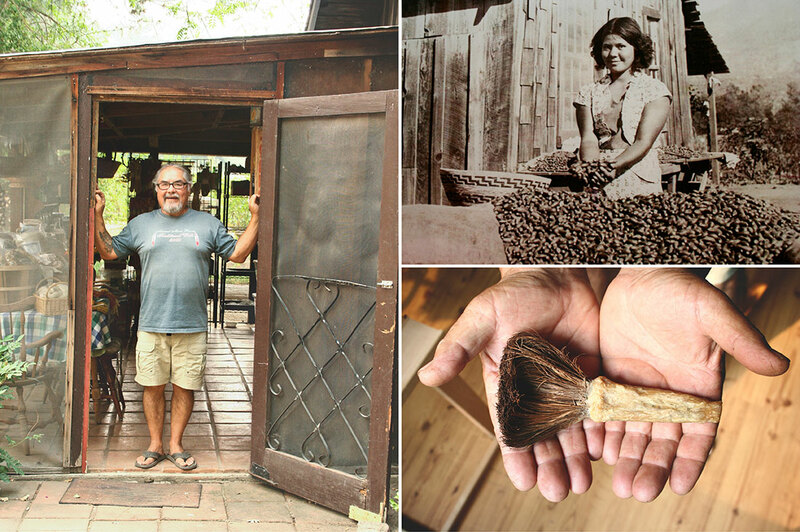 If you would like to meet Kim and Brother Bethel in person we highly recommend coming to this year’s Fibershed Wool & Fine Fiber Symposium on November 15th, where she will be sharing her remarkable life’s work in our Fibershed Marketplace. If you have interest in experiencing ‘Rancho Seldom Seen,’ in person—the opportunity will be arising on September 14th. 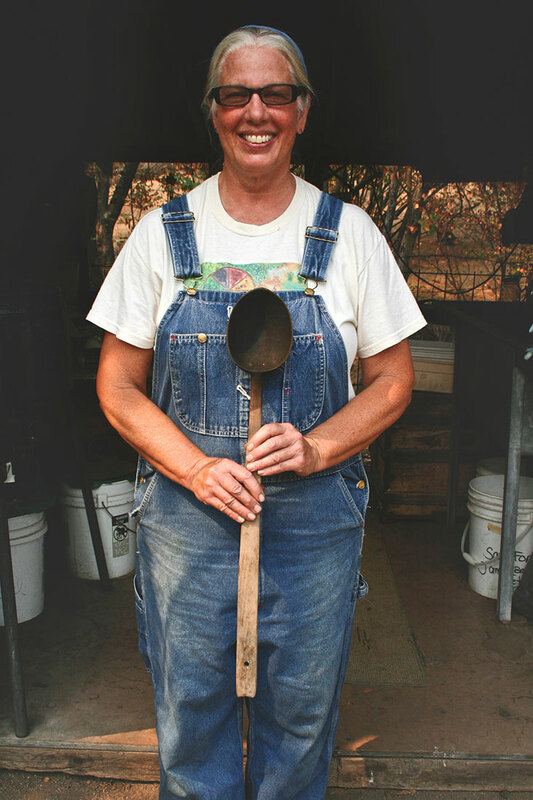 Kim will be giving a tour of the ranch and mill as part of the launch of her fiber CSA. I’d like to thank Alycia Lang for making the long drive to the Bethel’s with me, and for documenting their life’s work through her lovely photographs. And a huge thank you to Kim and Brother for their extraordinary (and that is an understatement) hospitality… The kayak trip was incredible…it was an honor to share a day in the life with you all.